Amazon Price: $39.99 (as of January 19, 2019 1:25 pm - Details). Product prices and availability are accurate as of the date/time indicated and are subject to change. Any price and availability information displayed on the Amazon site at the time of purchase will apply to the purchase of this product. The CabLED 12 ft. 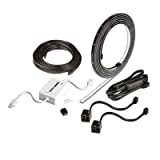 LED Landscape 12V Lighting Kit is a unique and customizable lighting strip that is designed to add on to your existing outdoor landscape lighting application. You can use the LED light strips right out of the package or you can cut and reconnect the strips using the additional accessories in the kit such as the universal connectors, the 12 in. jumper cable, and the twist connectors. The 12-Volt CabLED product can connect to most 12V landscape lighting low-voltage power packs sold separately at Home Depot. The 12-Volt BLACK strips cannot connect to the 24-Volt WHITE strips.